When a man has some time off from work, alone with just his thoughts, how does he fill his days? Does he write the great American novel? Spend more time with children? Work out incessantly at the gym? All noble pursuits I’m sure, but when personally faced this challenge, instead of choosing bourgeois intellectualism, coddling or vanity, I bravely opted to spend to my last vestiges of freedom (I was “in between jobs” as they say) wandering the cafes of Park Slope, asking baristas how much they charge for iced coffee and then abruptly walking out. Sure it sounds crazy, and to a man, I’m sure it is, but… OK, now I’ve lost my train of thought. My route was more a less a rectangle that encompassed my slightly geographically biased version of Park Slope. To the South, I went down as far as 15th street, chosen not only because it more or less represents the end of Park Slope proper, but also because it manages to encompass such “hot” iced coffee spots as Parco, Grumpy and Cafe Regular South. To the North, I went all the way up to the Flatbush and even cheated a little out of Park Slope with the Zip Car friendly (and reasonably priced) Heights Coffee. To the West, I only went as far as 5th Ave, though I had planned to include 4th Ave’s Root Hill and newcomer Zora, but I just ran out of steam. To the East, I went as far as 7th Ave, because let’s face it, on 8th Ave, it’s pretty slim pickins until you get down past 9th St, and once again, I’ve only got so much energy. Also, as far as what establishments I actually chose to go into, I mostly frequented coffee shops, cafes and bagel delis, or as I thought to myself, the places one might reasonably go into to get a cup of iced coffee. I did not go into bodegas, mostly because: 1) I had to draw the line somewhere, and 2) I’ve never had iced coffee at a bodega, so I figured the man on the B63 probably doesn’t get his iced coffee there either. Now, I’m no Nate Silver, but here are a few of things I learned through my explorations of the dark and seedy beany underbelly of Park Slope’s iced coffee joints. The best iced coffee bang for your buck in The Slope (out of all the places I visited) is at a place known for it’s chilled menu items, but not necessarily its coffee. For $1.75 at Haagen-Dazs on 7th Ave, you can wash down your double scoop of rum raisin ice cream with a 22oz cup of chilled joe, that’s a mere 7.9 cents per ounce folks. The largest “large” iced coffee is at Dunkin’ Donuts on 5th Ave and it’s a bladder busting 32ozs, which is equivalent to 4 cups, 2 pints, 1 quart, .95 litres or 1/4 gallon of cold java. A Dunkin’ Donuts large is also the second best deal on my list at $2.89 for 32oz, or 9 cents per ounce. One of the most expensive cups of iced coffee in The Slope (out of all the establishments I surveyed) is at Get Fresh on 5th Ave where $3.30 buys you a 12oz cup of cold brewed Stumptown (27.5 cents per ounce). UPDATE 1 (08/18/10): The owner of Get Fresh posted in the comments and informed me that they actually serve a 16oz sized cup of iced coffee. That would still make them the highest priced 16oz cup on the list, but it’s certainly a lot less offensive than $3.30 for 12ozs. I’ll confirm this next time I go by the restaurant and update the list accordingly. UPDATE 2 (08/25/10): As of today, Get Fresh sells a 16oz iced coffee for $2.50, so either: 1) I was misinformed the first time I went in, 2) prices have changed, or 3) I made a mistake! The most expensive 16oz small is $3.25 at Cafe Regular (7th Ave), Lucas Fine Foods and Cafe Grumpy. The least expensive 16oz small is $1.65 at The Bagel Hole on 7th Ave South. Area Bagels, Yogo Monster and 7th Ave Donuts Luncheonette all sell a 16oz cup for a reasonable $1.75 (admittedly none of these places would be my first choices for coffee). The most expensive 24oz large is $3.50 at Tea Lounge and S’nice. However, to be fair, Ozzie’s on 5th, sells a 20oz “large” iced coffee for an even pricier $3.75. Cafe Regular North and South charge different prices for the same cup of iced coffee, $2.75 on 5th vs. $3.25 on 7th. Ozzie’s 5th Ave charges more for a large iced coffee than Ozzie’s 7th Ave, $3.75 on 5th vs. $3.50 on 7th. A Starbucks “grande” is really the same size as a small iced coffee (16oz) most everywhere else. A 12oz or “tall” iced coffee is actually sold at very few places. Barnes and Noble and Starbucks, both sell the same Starbucks coffee in the same sized cups, but a “tall” is cheaper at Starbucks and a “venti” is cheaper at Barnes & Noble. Connecticut Muffin, (Starbucks’ across the street neighbor and local competition), charges more ($2.65 vs. $2.45) for a “small” iced coffee (the equivalent of a Starbucks “grande”) but the same amount for a large $2.95 (the equivalent of a Starbucks “venti”). Because of Archimedes Principle, if you order ice with your iced coffee, you are never the getting the full amount of the beverage listed on the cup size. At Starbucks, the rule of thumb is to fill it half with coffee and half with ice, which means a “grande” iced coffee is only about 8oz of liquid, or 1 cup. In general, if you’re paying less than $3.00 for a large (24oz) iced coffee, I would say you’re not being ripped off. Having said all of that, as I’m sure most of you know, you cannot put a price on deliciousness. While I can’t say I’ve sampled the wares at all of the establishments listed below, for my money I like the iced coffee at Naidre’s on 7th Ave (it’s not the best deal on the list, but it’s always tasty). Also, though it’s expensive as hell, the ginger and rosehip(?) infused iced tea at Get Fresh on 5th Ave, was the best non-coffee drink I had during my outings. More iced coffee prices and establishments after the jump. Next Post Sharon Jones and The Dap Kings at Celebrate Brooklyn! this is great! i’ve been grumbling all summer about the prices, quality, size, etc. glad you were “in-between jobs” to put this together. come to clinton hill/ft. greene/prospect heights next! Thanks Julie! Though it was a labor or love (or maybe obsession) I’m not sure I’ve got the energy to do it all over again. This is badass. FYI, Southside at 6th Ave and 18th St. is the best iced coffee I’ve had in the Slope (albeit a little pricey). I’ll have to check it out! But how much is it? @dave As far as I know, Gorilla, Grumpy and Get Fresh all have cold brewed iced coffee. I canâ€™t say that anywhere else does definitively, though I would imagine that both Cafe Regulars have it, as well as Cafe Martin, and one helpful commenter (who totally doesnâ€™t look like a shill) mentioned that Leafâ€™n Bean also has cold brewed iced coffee. Our iced coffee is cold brewed, which is a process that requires 24 hours and is only served through the next 6 hours, wherein, a new brew is used. We have always used a 16 oz. biodegradable cup- not a 12 oz. cup. This may have been an error on our part, if this is what was given to you or quoted by us. We only use local/organic milk and simple syrup made from organic evaporated cane or we offer agave. And most importantly, we give you service with a great big smile. @Juvenito I’ll double check cup size next time I pass by the shop. I tried to be as accurate as possible when making my rounds, but mistakes may have been made, by servers or possibly (gasp) by me. You forgot the iced coffee at Blue Sky Bakery on 5th. Not a “coffee place” you might think of, but in my opinion the best in the Slope. Certainly stronger than many other weak brews, and @ $2 if I recall. A real standout iced coffee is in Boerum Hill at One Girl Cookie, where the ice is made from decaf coffee, so your brew doesn’t get watered down. @Sloper I didn’t actually forget Blue Sky, but it was closed when I walked by (that place is closed a lot). There was one place I actually never got to in the nabe by accident, Cafe DuCharme, just off of 5th Ave on President http://bit.ly/9Tiboz. FYI, Red Horse Cafe on 6th Ave S uses coffee in their ice cubes as well. Have to agree about Blue Sky. And the coffee is an extra free bonus when you fill up your muffin card. They are open every day until early afternoon, when they sell out of baked goods. Usually around 2-3pm. Thanks for the tip about Red Cactus! Just tried the cold brewed ice coffee at Leaf and Bean. Wow, it was good and it’s only $2.00. Hi Bumper Shine… thanks so much for mentioning Naidre’s! We sometimes get overlooked in these types of things because the previous owner focused more on the food than the coffee, so in it’s first 7 years, Naidre’s was never seen as a real coffee contender. When I bought out the original Naidre 3 years ago, I was determined for our coffee, espresso, service and barista skills to be much better and to be taken seriously (and of course, keep the food as amazing as it was under the previous owner). We believe we have achieved our goal, and yet are always trying to improve, on the coffee, the latte art, and our espresso along with soon to arrive new espresso machines.. Besides our regular coffee, our new OMG! Espresso blend is something we’re really proud of, and makes a wonderful, strong iced Americano, for about the same price as our medium cold-brew. We think our cold-brewed iced coffee is something special. I know, I know, we’re not the cheapest, but we have a really great product. Our coffee is roasted locally at Porto Rico Importing, and our house blend is organic & fair trade. Cold-brewing requires a lot of extra prep, you can’t be stingy with the amount of grinds you put in there, and it requires a full 24 hours in the refrigerator before it can be served. I think our cold-brew stands up to the ice and has a wonderful, sweet flavor. I’m so happy you liked it, and thanks again for the mention in your article! Please introduce yourself next time you come by the cafe! – There’s plain old iced coffee… brewed hot coffee, that is left to cool. Meh. Drink it hot, or don’t drink it. If you heat-brewed it yesterday, I don’t want to drink it today. – Then there’s cold-brewed iced coffee… takes more coffee to make, requires a lot more prep. The ground coffee is never heated, it’s allowed to steep for at least 24 hours in the fridge, creating a very sweet, flavorful coffee with about a 70% reduction in acidity. Taste it before you start adding milk and sugar, you’ll be surprised at how much less you need, or none at all! This is true iced coffee! It can even be enjoyed by people with acid reflux. Perhaps that’s TMI, but a lot of people who love coffee and can’t drink it, can drink this. – Then there’s an iced Americano… this is what is meant by ‘brewed to order’ (unless you’re throwing hot brewed coffee over ice which is something no one should ever have to drink!). An iced Americano is espresso with cold water over ice. It’s not an apples to apples comparison with iced coffee, it’s a different product, as is drip coffee with milk vs a latte. You can have this “individually brewed’ at any espresso bar, and it surprises me A) how many people don’t even know about it, and B) how many people think it’s just ‘really strong iced coffee”, which leaves out the skill of the barista. IMHO, it rightfully belongs in an espresso comparison. It’s a great iced drink though (my personal favorite)… add a splash of vanilla, and it’s heaven! NYS does not require charging sales tax on coffee or tea. So my prices do not, and everyone else’s should not, charge sales tax. If you are being charged tax on coffee, you are being ripped off. This applies to â€˜to goâ€™ items only. @Janice Thanks for all your comments. To be fair, I made a lot of assumptions about sales tax at the various locations I visited as I wasn’t aware of the law. Having said that, I am almost 100% positive (see the receipts above) that Starbucks and Dunkin’ Donuts charge tax on their coffee. PS I’ve always wondered why coffee stir sticks and the sweeteners aren’t in the same spot at Naidre’s? Wait. . . You totally missed Cousin John’s. @northsloper Look again, it’s actually first on my list. @bumpershine. On the sales tax, you know it’s written in such a confusing way. Hey, I at least hope I’m right! Anyway, on the sweeteners, it’s a good question. Here’s the reason. It’s only the artificial ones we keep by the register. The regular sugar, natural sugar, agave etc… are at the coffee prep area. The reason for this is because those items, equal, sweet n’ low and splenda are expensive, and when we had them in bins at the other side of the counter, well, let’s just say we went through them a lot faster. When we changed the location, it reduced a consistent weekly purchase of these products, to only buying a case every 4-5 weeks. A dramatic difference. Sad but true. The Fair Trade iced coffee at Little Buddy on 5th Avenue and 18th (?) Street is REALLY good. @chbs Alas, I never made it past 15th st.
As previously mentioned, Southside is good but $3.25 for 16 oz. Baba’s Deli on 5th b/t 16th and Prospect has a surprisingly good 24 oz cup for two bucks. Root Hill Cafe is $2.75 for a large Stumptown and has awesome service. Has Beans has a 24 oz for $3.25. @Dan Thanks for the info, I was this close to checking out Root Hill, but it was incredibly hot that day and I just couldn’t bring myself to cross 4th Ave. A lot of people I talk to also like the iced coffee at the Dub Pie Shop in Windsor Terrace. Ozzie’s on 7th isn’t cheaper than Ozzie’s on 5th. They both charge 3.00 for 16oz. @jaymay Thanks, I was actually going to recheck the prices at Ozzie’s 7th Ave because I wasn’t sure about that one. I’ve updated the list. Wow. 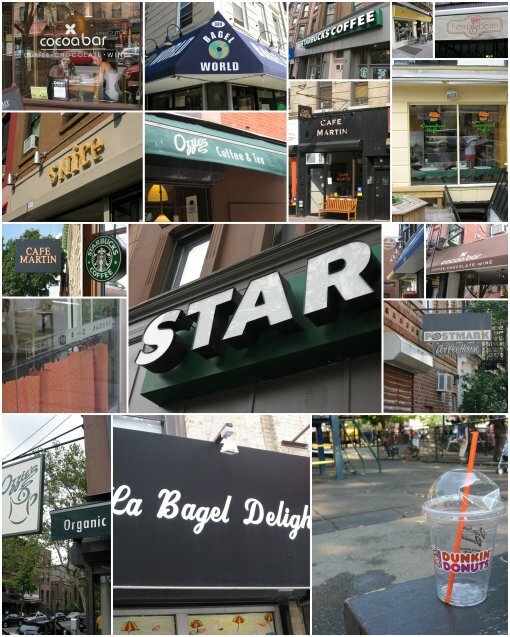 This is so thorough- you hit the major coffee spots right in my neighborhood. Thanks, Dave! Tea Lounge prices include tax. Thanks, I’ll update the list.